If you are looking to make big quantities of yogurt to feed a big family or for events, or you’re just looking to avoid the yogurt makers that have lots of smaller jars or containers, we’ve compiled the best for you! 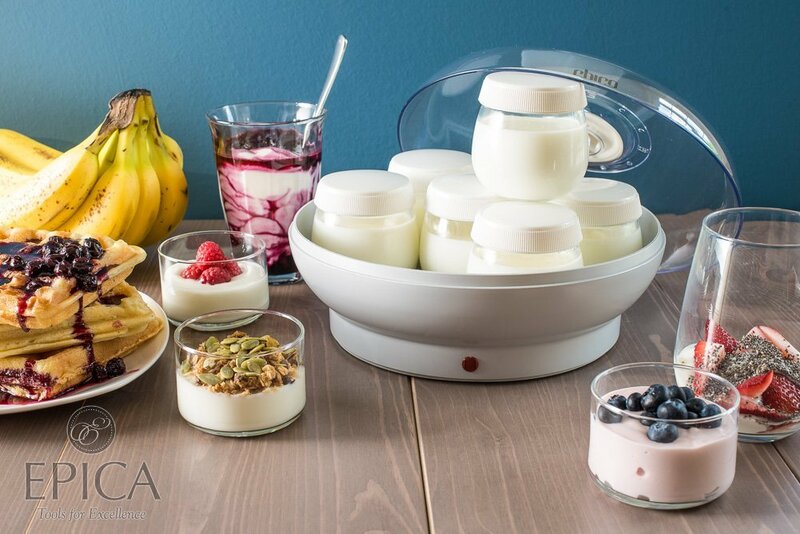 We are going to take a look at some of the best large capacity yogurt makers in this article, as well as being big, we’ve made sure that these are high quality too and will do a great job for you. Elegance is one word you can use to describe this machine, but also, usability and efficiency. It makes homemade yogurt easily and the results are amazing, plus it doesn’t look nasty in your kitchen! Cheesecloth bag for making your own cheese at home. The Euro Cuisine YM260 has a single 2-quart container enabling you to make enough yogurt for the whole week, or for a lot of people. It is extremely useful if you have a large family. Additionally, this is easy and quick to clean than the single jars. To simplify your work even further, it comes with a thermometer. Included is also a cheesecloth bag so you can even experiment with making cheese. It also has a time reminder. This is nothing more than a series of number which you use to remember to turn off the machine. 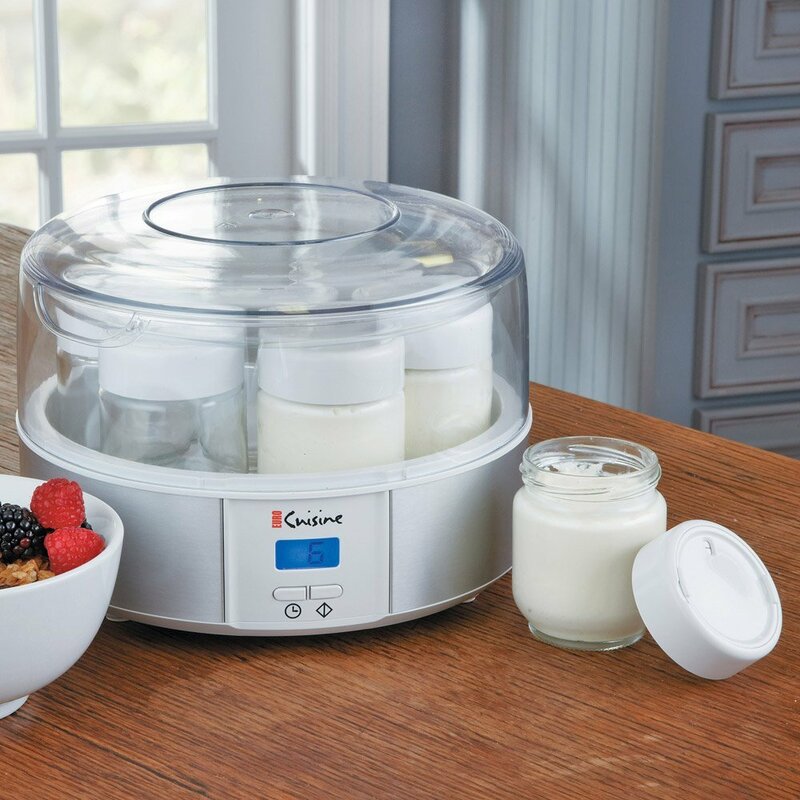 The Euro Cuisine YM260 is a great yogurt maker that many will appreciate. 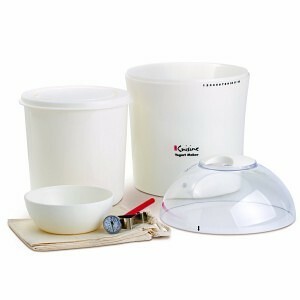 Another large capacity yogurt maker is the Yogourmet. It is simple in terms of looks. It does not have any scary or difficult features, but the good thing is that it does make great yogurt and in large quantities. The Yogourmet is very unique. 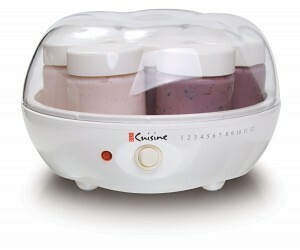 It uses a water bath system to provide heat to the yogurt. This provides for even heating resulting in same consistency. The yogurt is noticeably thick and it is great than that you can get from a store or even other yogurt makers. It also comes with a thermometer so you are always sure if it is at the right temperature all the time. The instructions booklet it comes with is another awesome addition. It also has recipes for you to experiment with too. If I were to be given a chance to change something about this yogurt maker, then I would go for the lid. Since it is not transparent, it is tough to see how things are progressing or you risk disturbing the whole process. Once you get a hang of it, this isn’t a problem. 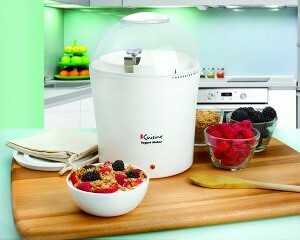 I love this yogurt maker. The water bath system it uses is absolutely revolutionary. And because of how great it is at making yogurt, I would urge anyone to take a look at this first. 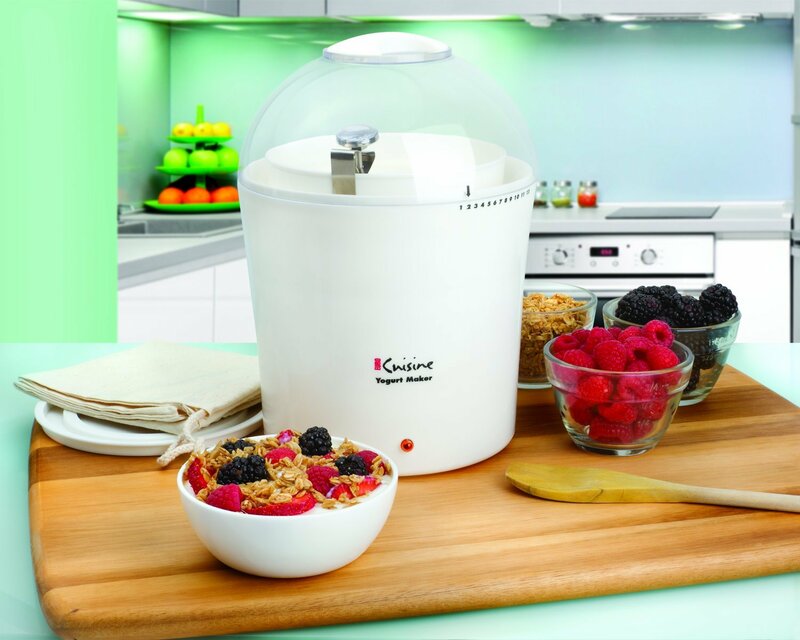 The two options above provide you with everything you need to make big quantities of yogurt. Both are very good quality and come with high ratings on online retailers, with reviews generally being very positive. It is possible to pick up yogurt makers which are cheaper than the two above, but they won’t do the job anywhere near as well. 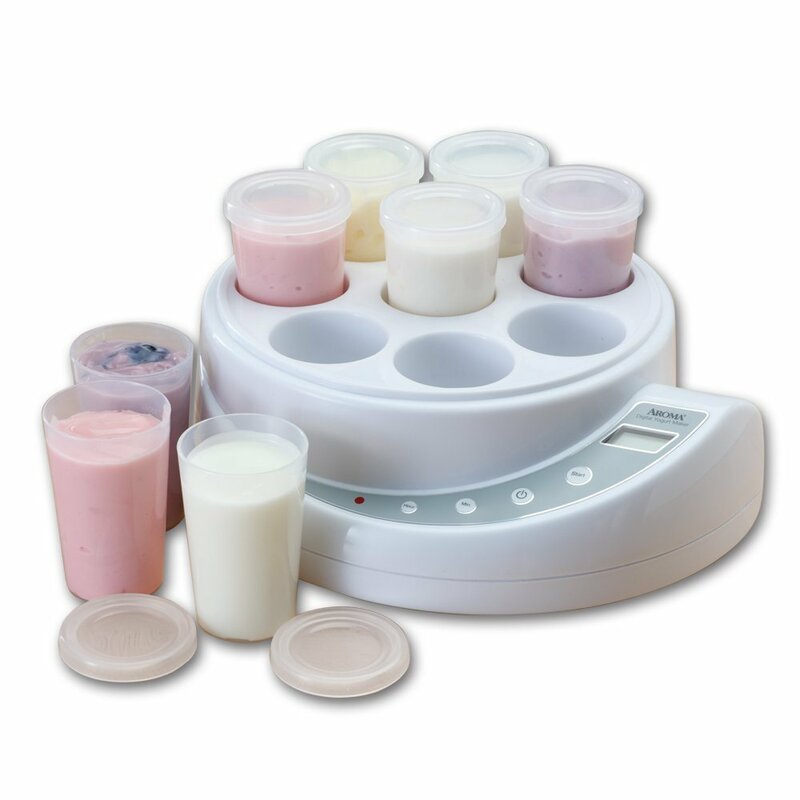 If you are one of those looking to move away from store bought yogurt that has unhealthy ingredients added, then you should be in the market to get a yogurt maker. If you are, lets introduce you to the Euro-Cuisine YM100. It one of the most popular makers and you simply cannot help but consider getting one. The Euro Cuisine YM100 is an improvement of its little brother the YM80 which costs less. Everything between the two is similar except that the YM100 has an automatic timer which is a very useful feature. 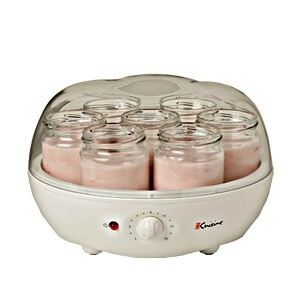 To use the machine, you first prepare you yogurt using whatever recipe you want. And when it is done, you take it and load it up in the glass jars, after which you put them in the maker. You then set the timer and press the Red light. The light will turn on showing that the machine is in operation. It is a really simple process and easy to use machine. This is where the timer comes handy. You can, for example, set it at 8 hours and go to bed. When the 8 hours is up, the unit will simply turn off. As you can see, this makes it so easy and less tiresome to use. One other thing you will definitely love is the even consistency of the yogurt. Taste will largely depend on your recipe, but overall, the yogurt from the YM100 is much better than one you can buy from a store. Getting to the jars, they are made of glass which is obviously better than plastic. They come with lids you can use to store your yogurt. They are also very handy if you want to take some on the road, in a lunch box for example. 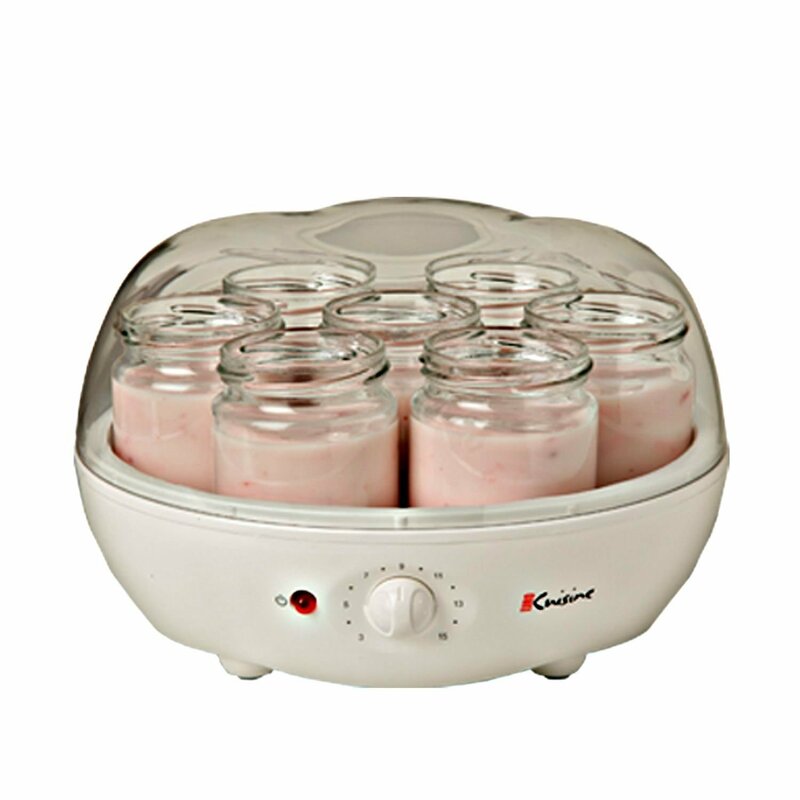 Checking people’s reviews clearly shows that many are happy with this yogurt maker. For example, on amazon the yogurt maker has a mighty impressive rating of 4.3 out of 5. This is from more than 500 customers who have bought the product. Many praise it for being so easy to use; producing quality yogurt all the time; for its easiness to clean. Euro Cuisine is a well-known name in as far as yogurt makers are concerned. The YM100 has been built on the same reputation of great quality at an affordable price. If you are looking for an excellent product that will get the job done without any fuss, I do not see how you can go wrong with this one. There is a reason it is one of the top selling models on the market today. This comes with our top recommendation. If you have had a chance to try Greek yogurt, it is likely that you thoroughly enjoyed it. However, the cost of purchasing one in a store is on the steep side. A solution, therefore, is to buy a yogurt maker. But not every maker out there can make Greek yogurt. Investing in a Greek yogurt strainer, like the Euro Cuisine GY50 is a smart decision, and this is a very affordable model, representing value for money, and it can even pay for yourself in the money you save on store-bought greek yogurt. You may think this will make the yogurt from scratch (I did and so did others). However, it does not. It is simply a strainer kit that gets rid of whey leaving you with a thick and fairly solid yogurt, better known as Greek yogurt or cheese yogurt. This means you can use it with store-bought yogurt or yogurt you have made with a different yogurt maker. Making Greek yogurt is easy provided you already have the yogurt. While you can use a cloth, by far, the GY50 will give you the best results. And there are not many Greek yogurt strainer kits competing with it. To begin with, this comes with a large strainer that can hold up to 2qts at a time which is enough to take a whole batch. This significantly reduces the time needed to work on making Greek yogurt. Like I said, the name is kind of misleading. To make you make your Greek yogurt on the GY50, you should have the yogurt in hand, homemade or store-bought. What you do then is pour it into the strainer and keep it in a refrigerator. After 6 to 10 hours, your Greek yogurt will be ready. Now here is where the GY50 proves that it is the best. As you transfer the yogurt into a bowl, it just comes out in one piece. This is a dream on some other pricier models. The only worrisome feature is the delicate mesh. If you get aggressive with it, it won’t live to make more Greek yogurt tomorrow. But with proper care, it can last many years. Fortunately, Euro Cuisine customer service is outstanding. A couple of customers who had their strainers damaged had them replaced at no extra charge. Cleaning is one feature not to be overlooked. The GY50 is easy to clean with the mesh as the only problem. Try to avoid using metal objects or anything you feel might damage it. Another feature I find really useful is the instructions and recipe manual. It is clearly written and you will not have a hard time understanding it. All in all, the Greek yogurt this makes is simply great. With a rating of 4.5 out of 5 on Amazon, this product is surely a winner. Many expressed concern on the mesh. As a matter of fact, it is the only issue on the whole strainer kit. And by reading the reviews, it is obvious Euro Cuisine has great customer service. 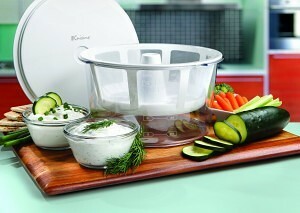 If you are into Greek yogurt, getting your hands on the Euro Cuisine GY50 is the right step in the right direction. This maker produces the best Greek yogurt easily. The delicate mesh is not a deal breaker in any way, it simply needs careful handling. And hey, did I said it is extremely cheap, offering great value for money? The Euro Cuisine YMX650 is one of the most sought after and best selling yogurt makers. Its range of features and price makes buying it a tempting proposition, and looking at the quality of yogurt it can make, many have a hard time choosing between this and other models. Making your own yogurt at home is beneficial in many ways. Most importantly, you have control of what ingredients to use, are able to create a healthy snack and avoid some additives that you may not want to consume, and you save money than if you were to be buying in store. The YMX650 is not entirely different in terms of features with other models from Euro Cuisine. As a matter of fact, there are only a few differences. Here are the features in detail. Comes complete with a thorough and helpful instruction booklet. Using the YMX650 is really easy. It only has two buttons for controlling everything. You can set the timer depending on your tastes, ideally between 6 to 12 hours. The maximum amount of time you can set is 15 hours. To sweeten the deal, it has an LCD display. Despite being simple, it adds a nice touch to the whole machine and it makes reading a bit easy since it is backlit. When in operation, it counts down until the set time is over and it makes a beep as notification. The automatic timer is really handy since you might be preoccupied with other things or may have gone out of the house and you will have nothing to worry about knowing the timer will turn the unit off when it is done. Another feature I liked is that the lids of the jars have dates. As insignificant as this might seem, it is very useful. It helps you keep track of when the yogurt was made. It is particularly handy if you make yogurt regularly. Since the YMX650 comes with only 7 jars, bigger families are better off purchasing more jars to keep a steady flow of yogurt. And if you want, you can buy a bigger Pyrex 7-Cup Glass Bowl that easily fits in the maker. It is also important for making Greek yogurt. Coming to the yogurt itself, the YMX650 does a commendable job. It is better than many of the yogurts you can buy in a store, and of course you have more control over what goes in it! Included in the box is an instruction booklet that also contains recipes. Cleaning is not difficult at all. The jars are made of glass and are dishwasher safe. But if you are feeling a bit lazy washing all the jars, you can purchasing a bigger container. Checking on Amazon proves that this is one of the best yogurt makers on the market. It has been rated 4.6 out of 5. This is better than the 4.3 stars earned by the YM100 which is the most popular yogurt maker. If you are searching for a great yogurt maker, then the YMX650 could as well be your answer. It has great features at an affordable price. But most importantly, it is one of the machines that produces great homemade yogurt. Euro Cuisine YM260 yogurt maker is for those who love yogurt and are ready to try creating the homemade variety. It has a 2 quart capacity and a timer on the side so you can know when the process is finished. The YM260 comes as part of a kit, which also includes a specially designed cotton bag for making cheese, a stainless steel thermometer and a serving bowl. This appliance comes with a 3 year warranty. It is priced at around $40, but does it represent good value for money? Works with milk of all varieties including alternatives to traditional cows milk. Makes yogurt in just 6-8 hours. The YM260 is generally met with very positive reviews, as you can see from Amazon, where it has averaged out to a 4 star review (out of five) which is very respectable, especially for something on the cheaper end of the market in comparison to the more “deluxe” models. This does hold its own when compared to many of its more expensive competitors. For the health conscious, homemade yogurt is a healthier option than commercial yogurt. Commercial yogurts come with artificial flavors, added sugar and preservatives. One also controls what goes into homemade yogurt. There are endless flavor options and the consistency, amount of fat and the sweetness are controlled by the user. Soy milk and coconut milk are also options, offering an alternative for those who can’t consume cow’s milk. One of the benefits of yogurt is that it contains probiotics, which promote good gut bacteria and help to boost the immune system. Those who are lactose intolerant can also often consume yogurt, as the live cultures that it contains feed on the lactose. Commercial yogurt tends to have less of these, it can sit on the shelf a long time before it goes bad. The probiotics gradually die off during this time. With homemade yogurt, enough is generally made to last up to ten days. A fresh batch can be made regularly and at less than the cost of buying commercial yogurt. Yogurt in general is also beneficial for the amount of calcium that it contains. The protein it contains is good for helping to repair muscle cells, especially for those who lead very active lifestyles. Studies have also shown that it is beneficial in preventing high blood pressure. The timer on the YM260 is not a true timer in the sense of that on a microwave. Rather it is a reminder, consisting of the numbers from 1 to 12 on the side of the base. The lid has an arrow on it that points to the time that the unit should be shut off by the user. It also does not have an on and off switch. The unit is turned on by plugging it in, which may not help if the plug is in an awkward place as the mixture should not be moved during its cycle until it ends. The YM260 is a good yogurt maker for those interested in making their yogurt at home. It is not as convenient as some other brands, as it does not have a built in thermometer or a real timer, nor an on/off switch. That said, it is cheaper than many of the options on the market, and does offer good value considering the features it has for the money spent – it is a good purchase and I give it a 4 out of 5 as a yogurt maker.